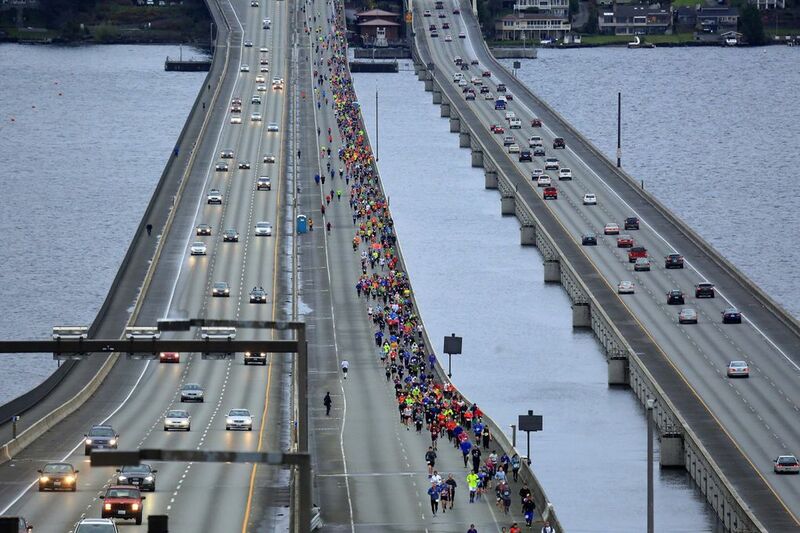 Light-rail construction across the I-90 floating bridge will begin June 3. The project follows a series of engineering successes and failures since the original bridge's opening in 1940, first connecting Seattle and the Eastside. No train tracks in the world have gone across a floating bridge. That’s set to change in 2023, when officials say the East Link light-rail line will open, connecting Seattle and the Eastside. Construction will begin June 3, closing the center express lanes, where the tracks will be built. Carpools and buses will instead use new HOV lanes. The plans for light rail span decades. This timeline looks back on those discussions, as well as design highlights. But first, we’ll highlight the passageway’s storied history. The bridge spanned 6,561 feet with 25 floating pontoon sections, weighing a combined 100,000 tons. After 18 months of construction, Lake Washington became home to the largest floating structure in the world. A crowd of 3,000 gathered to celebrate the new highway’s official opening on July 2. And the bridge quickly became a hit for leisurely drives. Officials at the time said the four lanes — named the Lacey V. Murrow Memorial Bridge after a state highway director — would be safe in 90 mph winds and stay afloat even if 20-ton trucks filled its entire stretch. Decades later, as commuter traffic grew, transportation officials set up a reversible lane system on the bridge in which three lanes would go into Seattle in the morning and three lanes headed toward the Eastside in the afternoon. Highway operators used overhead lane signs to mark the switches. Federal and local government leaders signed a pact saying high-capacity transit — either by rail or bus — would someday connect Seattle and the Eastside over Lake Washington. 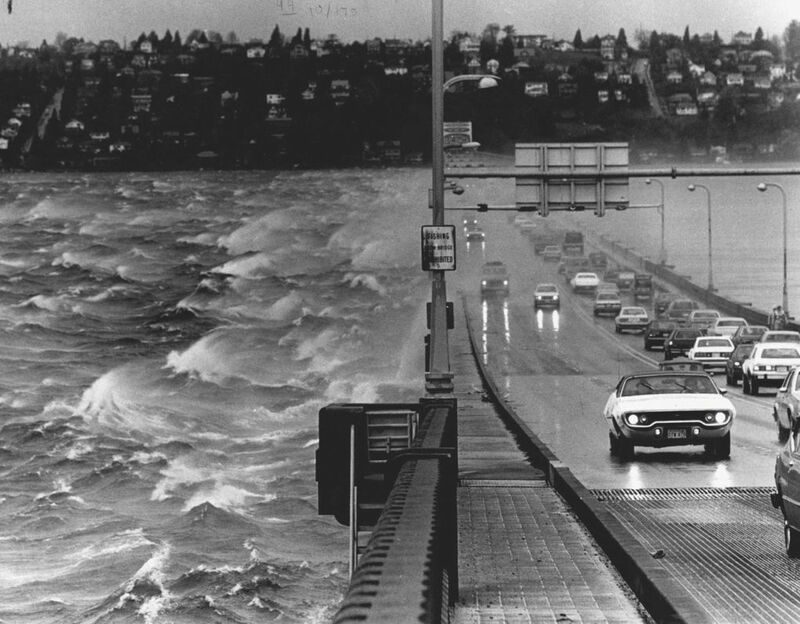 That agreement was for the future I-90 Homer Hadley Bridge, which was completed in 1989, running parallel to the original floating bridge. The 1940 Lacey V. Murrow bridge’s floating design wasn’t the only experimental part of its construction: Engineers designed a floating draw span, which created a curve for drivers in the middle of the bridge. The mid-lake bulge proved dangerous for motorists from the start. Even before the route’s official opening, a driver drove into an 8-foot opening in the middle of the bulge. That was the first of hundreds of accidents. While inspecting the bridge’s cables underwater in the early 1980s, for instance, divers found a car at the bottom of the lake with a teenage girl’s body inside. 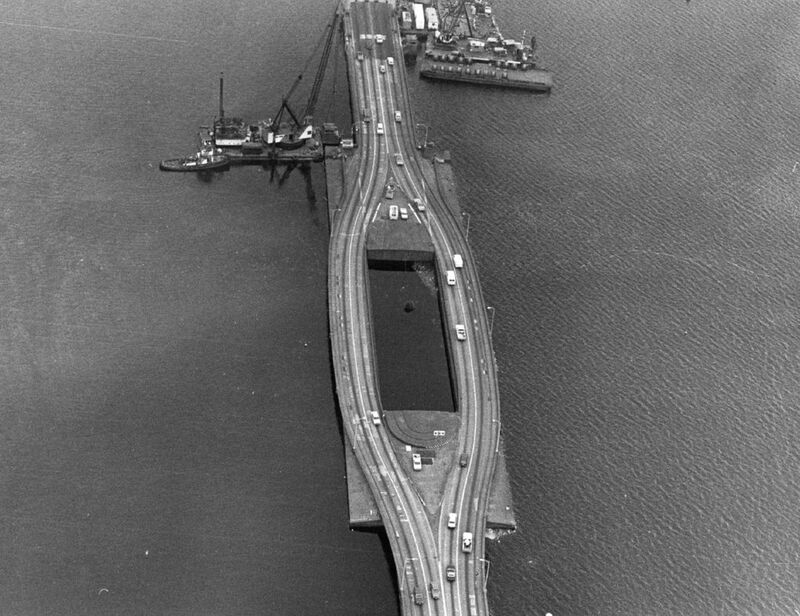 Public outrage over the accidents led to a safety-improvement project in 1981 to replace the bulge with a straight, unmovable pontoon section. The update, though, didn’t resolve all of the bridge’s safety woes. The freeway was still prone to head-on car crashes. For each year before and after crews removed the curves, for example, typically about three people died and 70 to 80 were injured in collisions. 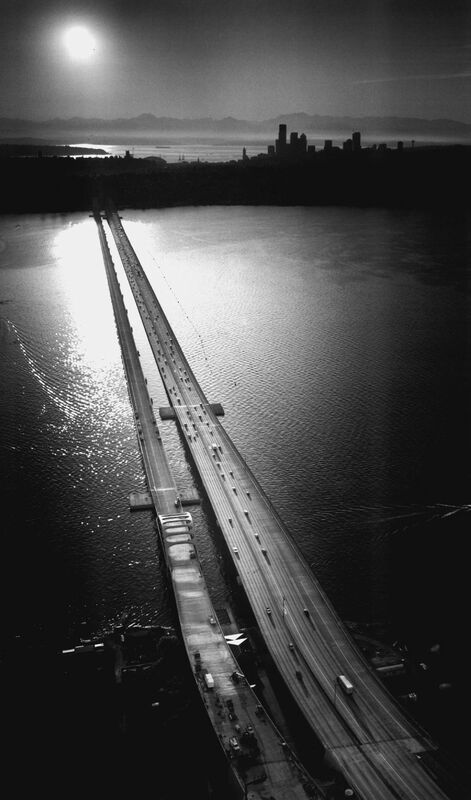 After a half-century of commutes, Lake Washington’s original floating bridge sank. Fierce winds and strong rain during Thanksgiving weekend broke the bridge apart, and sections tumbled into the water. “Later in the afternoon, the bridge shrugged once more, sending another section to the bottom of the lake,” a KING 5 anchor reported. The bridge had been closed to traffic for a renovation project; no one was injured. Support cables on the Homer Hadley floating bridge, which had just opened about 60 feet away, however, sustained damage. Footage of the debacle was shown on newscasts across the world. 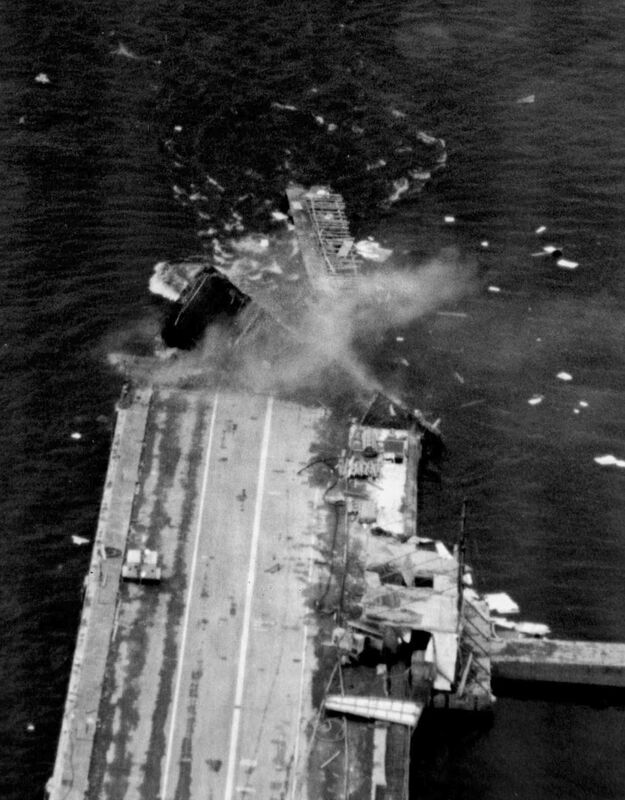 The History Channel spotlighted the collapse, describing what caused the damage. In short, the storm filled the bridge’s pontoons with too much lake water, and they couldn’t handle it. “After very extensive study and very sophisticated computer modeling methods, the conclusion was that concrete pontoons simply don’t float when they’re full of water,” said Ken Carper, a former architecture professor at the Washington State University, in the segment. A court dispute between the state and the renovation project’s contractor over damages spanned years. In August 1992, the contractor’s insurers agreed to pay the state $20 million and dismiss claims totaling more than $28 million, transportation officials said. “Neither party admitted any reliability or responsibility for the sinking,” said Peter Ralston, an attorney for the contractor, Traylor Bros., at the time. Crews embarked on a massive project to rebuild the I-90 bridge. 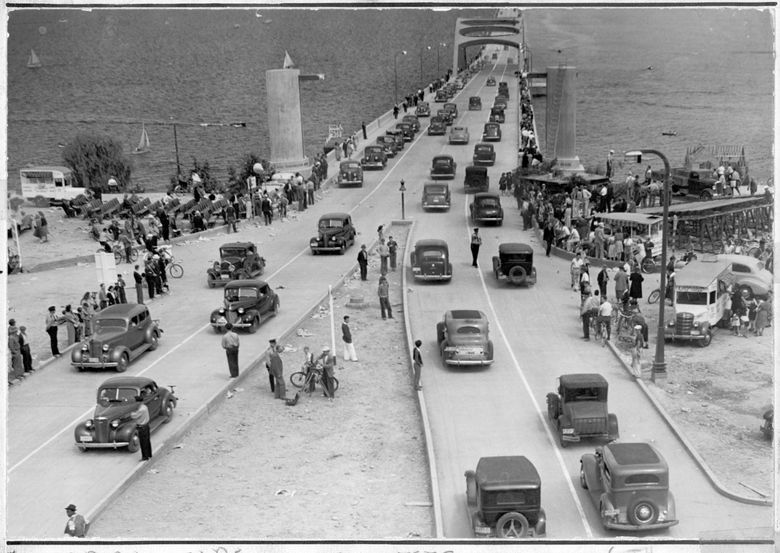 After years of construction, the eastbound bridge we know today opened to traffic, replacing the original floating freeway. The project included completing unfinished ramps connecting I-90 with Seattle’s Interstate 5. That effectively finished the last seven miles of I-90, meaning drivers could now travel from Boston to the Emerald City without leaving the freeway. September 2005: Is light rail an option? The region’s traffic was growing, and transit officials were preparing a ballot measure that would expand light rail to the Eastside, pending voter approval. 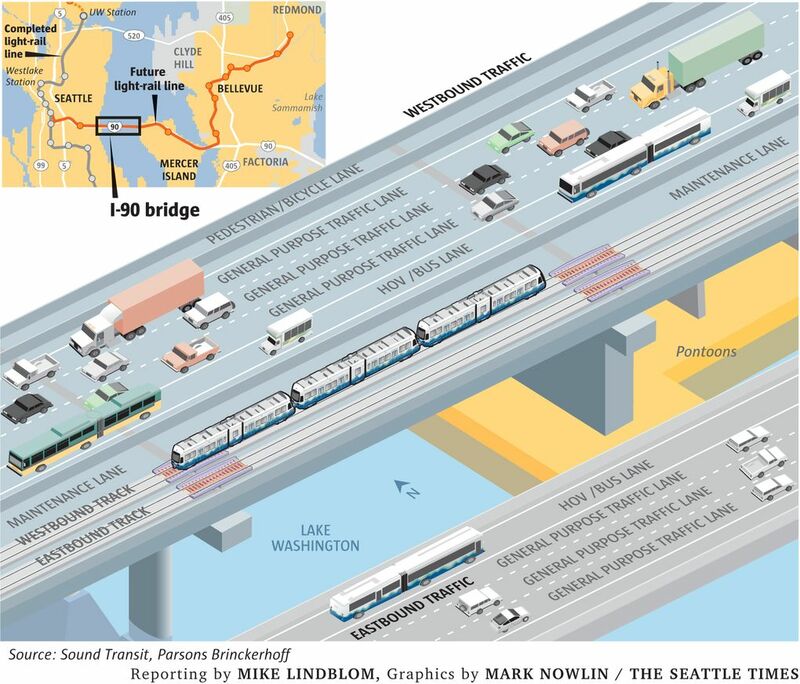 Could the I-90 floating bridge safely hold the weight of a train? To check the freeway’s buoyancy, state bridge officials launched a test to simulate the weight of light-rail trains. Crews drove eight flatbed trucks loaded with concrete slabs across the bridge for three nights, proving the freeway capable, according to Sound Transit. Fall 2006: What must transit leaders consider? Plans for light rail were taking shape. Officials with Sound Transit, the Federal Transit Administration and WSDOT launched an environmental review for trains on the floating bridge, which included gathering public feedback. The review lasted five years. For construction work to move forward, though, transit leaders needed voter approval. Also, the governor’s office in 2006 reconfirmed a decades-old agreement between Mercer Island and transportation agencies that allows the city’s drivers to have direct access to the I-90 bridge’s HOV lanes. WSDOT reconfirmed that agreement in 2007 and again in 2011, according to city records. Those pacts became important for the city of Mercer Island years later; it sued to postpone the I-90 project on grounds that transit officials weren’t honoring those longstanding agreements with their plans for closing the freeway’s center express lanes for light-rail construction. Voters approved the $3.7?billion light-rail expansion in a big transportation package, called Sound Transit 2, to add commuter train, light-rail and bus service across the region. The I-90 line is funded predominantly by sales and car-tab taxes paid by Eastside residents. Sound Transit laid out designs for light rail on the floating bridge, while wrapping up the environmental review and preliminary engineering work. Project managers made updates and adjustments to those plans over years. The light-rail tracks will replace the Homer Hadley bridge’s current reversible express lanes. Crews are adding HOV lanes to the mainlines to make up for the loss of roadway space. Final engineering work revealed the challenge of retrofitting the floating bridge, which moves with Lake Washington’s water levels and must stay buoyant. Those findings resulted in a $225 million cost increase for the project. That money would come out of contingency funds, without causing construction delays or a tax increase. Less than two weeks later, WSDOT chief bridge and structures engineer Tom Baker approved the final design, which features eight custom joints called track bridges that must adapt to the lake’s changing level, as well as winds and waves. Those flexing sections will be installed under the train tracks where the fixed and floating bridge decks meet. Project managers have spent $53 million to design the stretch of light rail across Lake Washington alone. A derailed train would sink 200 feet to the lake bottom. 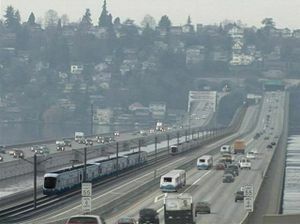 This digitally manipulated photo by Sound Transit shows the proposed light-rail system that would run on I-90. Besides funneling I-90 carpools and buses into new HOV lanes, the light-rail project will displace hundreds of park-and-ride users when crews close the South Bellevue lot on May 30. Here’s more information via Sound Transit on how construction will impact commuters. Passenger service is set to start in 2023, connecting Seattle to Mercer Island, Bellevue and Overlake. Crews will run the trains empty for at least three months to test the tracks before opening them the public. Sound Transit anticipates about 50,000 daily riders by 2030 — not including a Redmond extension that’s set to finish in 2024. That extension is funded by Sound Transit 3 taxes, which voters approved last fall. That package is a 25-year, $54 billion plan for 62 new miles of light rail from Tacoma to Everett, as well as more commuter rail and bus service. 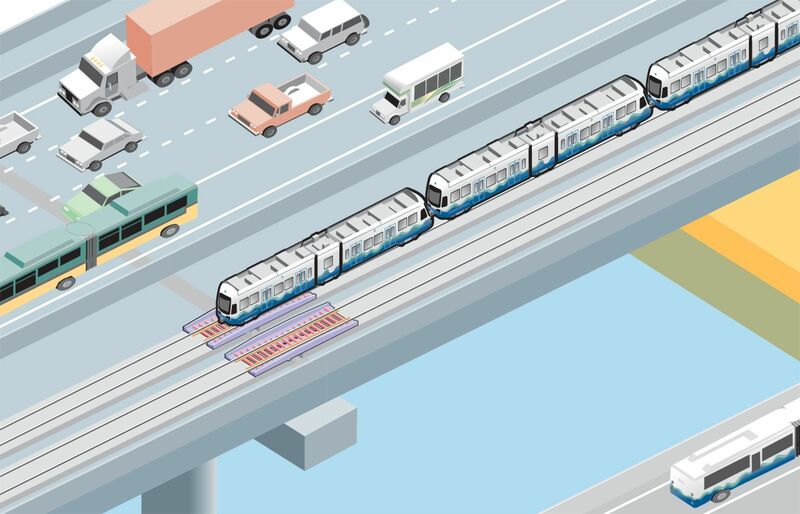 Here’s a Sound Transit animation of what the completed East Link light-rail line will look like. Seattle Times transportation reporter Mike Lindblom contributed to this report, which contains material from The Seattle Times archives.